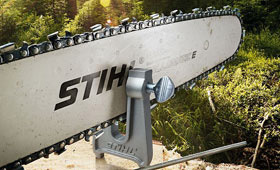 Choosing the right saw chain is a crucial factor for working efficiently with a chainsaw, which is why STIHL offers the perfect saw chains for every need, performance class and chainsaw make. All chains boast robust, premium quality. STIHL saw chains are manufactured with precision Swiss workmanship at the STIHL plant in Wil. They are made with special machines that STIHL also develops and produces.